Elizabeth Mitchell and Jim Keating tied the knot on February 21, 2009. We love that they processed down the aisle TOGETHER arm in arm, as a mature modern couple in their simple ceremony at Bond Chapel at the University of Chicago! We especially loved Elizabeth’s unique bouquet – which was perfect for her vintage inspired lace sheath gown and their sophisticated cocktail reception for 60 of their closest friends and family at the Quadrangle Club (photo by Joe Gallo). This textured bouquet for the late February wedding was designed and constructed by the LOLA Pro’s featuring winter kale, fern, succulents (sometimes called ‘hens & chicks’), mini callas, early spring lilac, dusty miller, scabosia and winter greens. 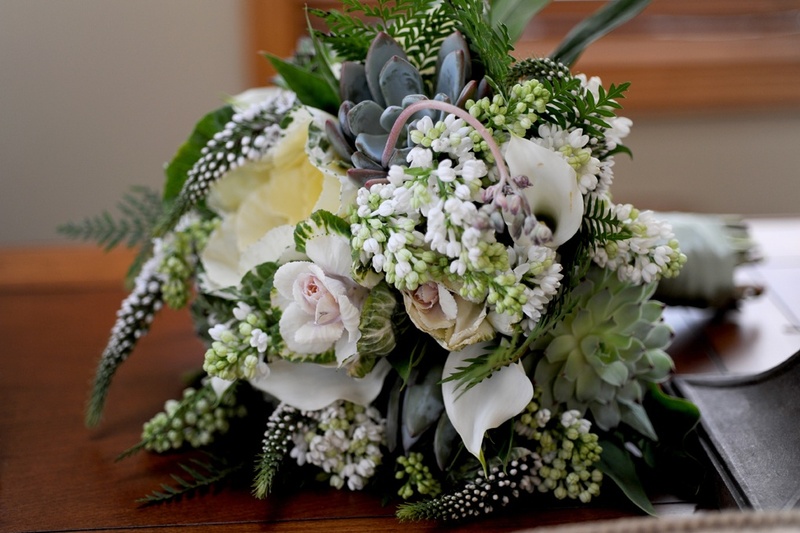 The bride wanted very few actual flowers, and a concentration of cool wintery shades of green with touches of white. The use of succulents in bouquets and centerpieces is a huge trend for the coming season of weddings regardless of season!